Thumbs or no thumbs...I don't know how you humans walk around with these things. Even Waffles is rolling his eyes. Today's Saturday Photohunt theme is HANDS. You can play too! Glogirly and I haven't been around much to comment on your blogs over the past few days because we're working on a special top-secret project. We'll be sharing more about it in the near future. We think you're gonna LOVE it! We need your help! We're looking for (now don't judge) a Chihuahua. That's right, a dog. 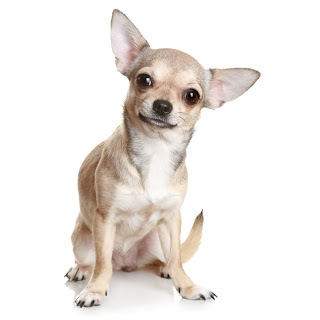 We need a pawsome photograph of a real Chihuahua doggy. We don't want to use a stock image, we want the real deal. You know, one with a name and all. Here's a stock picture of the kind of pose we're looking for. Do you know of a doggie that fits the bill? Let us know! Just click on the dog to send us an email. We know Chi Chi from Prancer Pie! He is a real cutie too!...., but Katie, why in the world would you be working on a project that requires silly little doggies? Hands are for servants. We kitties don't need 'em. My Grete woofie said she is willing to help but she is about the size of more than 10 of those little dog-like creatures....hmmmm. I guess I better let her know her services aren't needed. Secretly, Grete really wanted to meet Waffles. Love your hands! And Waffles' eye roll. No woofies here, or any of that genre that we know. Maybe they can help with your woofie picture(s). Chi what? Brad is offended that it's not his photo that you're seeking. purrr...meow! Well, Jemma is a long-haired chihuahua, but her mom is a professional photographer and might not want to share any photos, which would be understandable. Awesome photography, though! 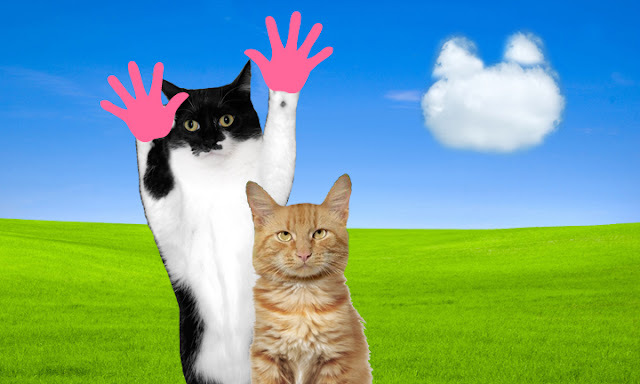 The first thing we thought when we saw your pink hands was cool Katie can open the catfood for us. You have a way to tease us and have us coming back to learn more! Happy weekend to you and your humans! Good luck finding the doggie! If you can't, Tutu says she can do a Chihuahua for the right fee. MOL. Another secret? You are always up to something, Katie!! We has a red heeler at our house. Cinnamon. Me too wonder why on earth you need a silly little woffie for your next project ??!! If I did the PhotoHunt there'd be a photo of me biting TW's hand! HAH! Hope you found your Chihuahua. Time is money. FaRADaY: ooh LOOK! JAZZ hands!! !